“Assistive technology” and “assistive devices” are names for the tools & gadgets that might be the key to remaining independent at home for a variety of individuals. Assistive Technology Loan Fund (ATLF): The Assistive Technology Loan Fund was established to help people with disabilities purchase assistive technology devices and services. This program provides low-cost financing to persons with disabilities to purchase assistive technology devices that allow for greater access, increased mobility, enhanced communication and job opportunities. Examples of devices people have purchased through this loan fund are motorized scooters, vehicle adaptations, ramps, hearing aids, and more. ATXchange: Are you looking to buy, sell or trade gently used assistive devices? This Michigan-based website will allow you to post items you have to sell or give away AND to search for items you need. It also includes used vehicles that have a variety of adaptations and modifications. Great Lakes Loan Closets: This website is designed to help you find free or low-cost home medical equipment in your community. To find resources in your area, simply click on your county below. Local programs will appear first, followed by state and national programs that you may qualify for. We work with Lending Hands, a non-profit in Southwest Michigan that provides free medical equipment on a temporary basis. Listed below are nationally known companies that sell assistive devices. Connect Hearing: For the deaf and hard of hearing. HARC Mercantile: Providing hearing amplification, assistive communications products, and accessibility solutions. 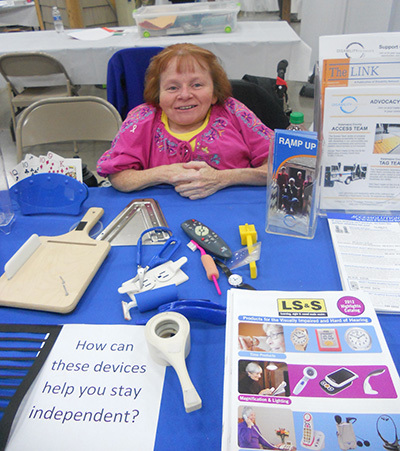 Independent Living Aids: Products for independent living for persons with low vision and blindness. Live Oak: for independent living. Maxi Aids: Products for independent living. Download this pdf titled Tips for Choosing AT Products for Yourself. If you need more information about assistive devices or are trying to find something to help with a specific situation, call us at (269) 345-1516.